Welcome to the Cruising Section. Why choose to cruise from Thorpe Bay? – about six hours a tide. Some days you can sail first thing and return on the evening tide. – straight off the mooring, whatever the wind direction. There’s no river or gut to sail down every time. bank-holiday rallies to Calais, Hamford Water, Harwich etc. longer cruises up the coast to the Orwell, Stour, Deben, and Ore, or across to France, Belgium and Holland. drying moorings available for bilge-keels and centre-boarders. member-run launch ‘Polly’ may be available. club rowing dinghies always available. little mud at low tide – it’s an easy walk to check over or work on the boat. some members walk out just before tide comes in – by the time you are ready, you’re afloat! You are never on your own with a problem. SOUTH takes you to the Medway with Queenborough, Gillingham, and Chatham. Or go around the Isle of Sheppey, under the Kingsferry Bridge and Conyer and Faversham. EAST to Whitstable, Margate, Ramsgate and across the Channel to Calais or Gravelines. Then head up the Belgium coasts to Holland or down to Boulogne, Cherbourg and the Channel Islands and on to Brittany. NORTH to HavengoreBridge and the creeks to Burnham, or go offshore to Bradwell, West Mersea, Hamford Water, Harwich, Woodbridge and Aldeburgh. Explore the Crouch, Blackwater, Colne, Orwell, Stour, Deben and Ore.
WEST takes you to Gravesend, Greenwich and St Katherine. If you have more time you can take the mast down and go to Windsor and Oxford. Four times a year we race round Thames buoys and beacons, and occasionally we have long distance races. Devoted racers also race with other clubs on the foreshore and enter the six interclub races, the biggest one being the Nore Race. Thorpe Bay is too exposed for winter mooring, so smaller cruisers (up to 2 tonnes & 23′) lift out to the club boat-park until the spring. 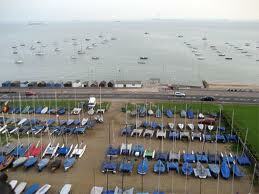 Larger boats generally lift out at Canvey, Leigh, or at River Crouch boatyards. 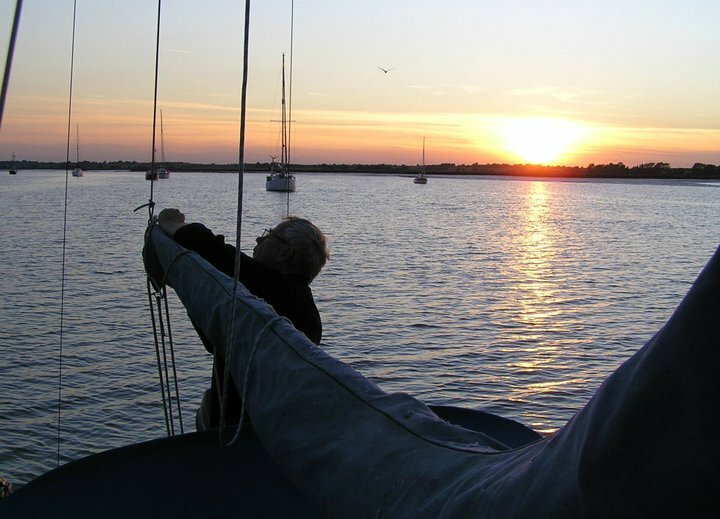 So if you’re looking for a cruising home on the Essex coast, or want to try cruising while keeping the dinghy-racing option open, come along to the Club next Tuesday, have a drink, meet us and find out more – you’ll find a warm welcome!